EMG Equipment - New EMG Equipment from Midwest Neuro Medical! Devices from Applied Neuro Tech & others, Available Now from EMG Equipment.Com! Two day EMG Training Included! Included two day hands-on training with one of our technicians. You may also purchase any additional training sessions that your clinic needs. You'll have plenty of supplies to get you started including surface & Needle Electrodes, instructional DVDs for both NCV and EMG testing. Also included are manuals, posters, gel, and rulers. 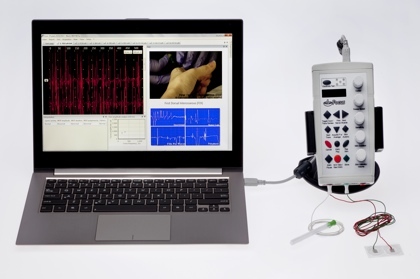 Access your EMG study results instantly in the cloud from your (included) iPad Mini or any other internet connected device with our state of the art software analysis and visualization tools. An iPad Mini loaded with FaceTime is the next best thing to having an EMG tech present in your office whenever you need support or have questions regarding your device or performing NCV/EMG tests. Also check out our Used EMG Equipment, EEG Equipment & Used EEG Equipment pages!